I guess by now if you have been following Ang Sarap for some time you will have an idea how Filipino’s love cheese. Cheese is a very important in our cuisine but we don’t consume them much like our Western counterparts where they usually pair it with wine, we use cheese mostly as an ingredient. You can see them used as a main ingredient in ice creams, fruit salads, spring rolls, breads and it is also used as toppings and flavour enhancer to dishes like Filipino style sweet spaghetti, Kaldereta and puto to name some. The most common cheese used back home was cheddar, Edam, kesong puti (goats cheese feta) and quickmelt (a light creamy flavoured cheddar that melts easily). If you notice cheese is not just used in savoury dishes but it is also widely used in desserts, that might seem to be an odd idea for non-Filipinos as I had never seen cheese combined with something sweet in other cuisines. I still remember bringing my home made cheese ice cream to office one day (there’s only 2 Asians in my department me and a Chinese), just imagine the reactions I got. Anyways at the end of the day they all loved the taste of it, I did not expected that neither them. Today we will be making something sweet again, this time it’s a cheese cupcake, a very popular baon (school snack) for kids back home. Cheese cupcake basically is a cupcake flavoured with cheese, usually cheddar to give it a cheesy taste. Unlike Western cupcake counterparts this is never frosted and designed to look pretty but it is made really simple just with a topping of grated cheese. By the way before our recipe I just wanted you to know that when you are now or happen to visit Melbourne, you can try cafe cakes and treats made at Little Bertha. All of Little Bertha’s cafe cakes and treats are handmade, balancing flavour with substance . Click here! In a separate large beat together butter, sugar and eggs. Slowly add the flour mixture and condensed milk to the creamed butter and egg mixture while beating in low speed, combine until smooth in texture. 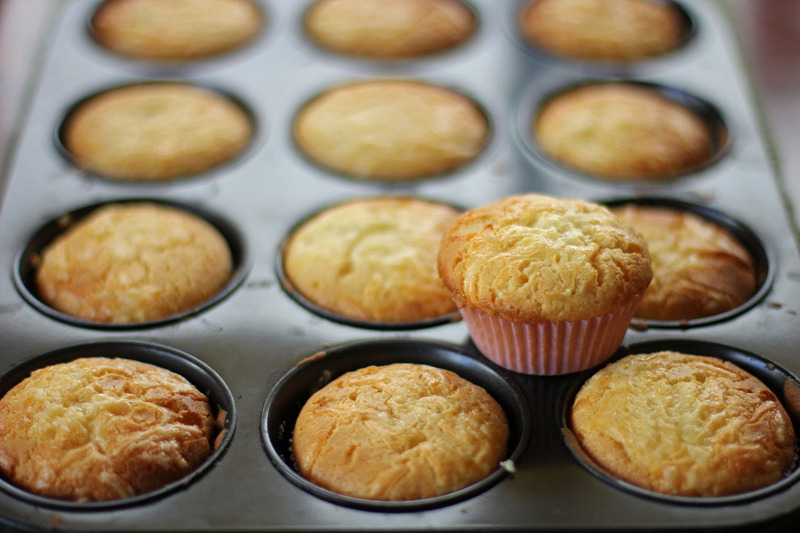 Scoop batter into paper-lined muffin cups to ¾ full. Top with cheddar cheese and bake in a 180C pre-heated oven for 30-35 minutes or until toothpick inserted comes out clean. Top should be golden and crispy. FYI, cheese in desserts is quite common in Latin and European cuisines. I love the unique pairing of sweet & salty flavours. In fact, an Indonesian friend once made a sweet chocolate type sandwich, with a layer of cheese. Initially so foreign, but then so very good! sure they’re very moreish indeed! Chocolate and Cheese, now thats something intriguing. 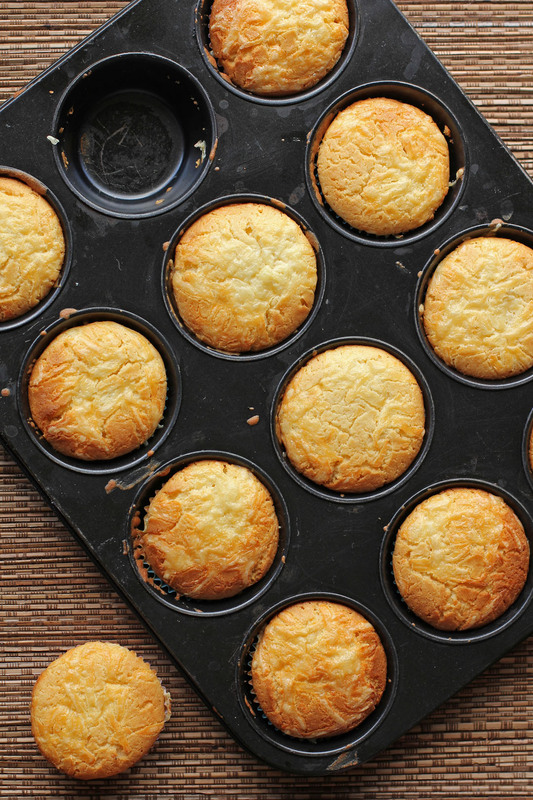 The cheese cupcakes sound like a nice accompaniment to a lot of meals. I know my husband would love them. This cheese cupcake I’ve been testing unsuccessfully, the taste similar to the ones a co-worker in Manila sells at work, hence, doesn’t want to give out the recipe since her household help was making & selling it, as a side income. Now I know what’s missing in my recipe, condensed milk. Thanks a lot. Try this one out, its nearly similar to the bakery or tindahan style back home. Interesting to see cheese (other than cream cheese in frosting) used in a dessert here! The combination of cheese and condensed milk is SO interesting to me. Raymund, in the States, we have two products, evaporated milk (which has some of the water removed) and sweetened condensed milk (which has sugar added and, I think, some of the water removed). The most common brand is Carnation (Nestle), while La Lechera is popular in hispanic markets. Is one of these what this recipe is calling for? Thanks for sharing your wonderful recipes–many bring back fond memories of living in Asia. Yum. The cupcakes look good. I am sure they taste better. I tried cheddar ice cream for the first time not so long ago and it was WONDERFUL. I wish it was more popular in the US. These cupcakes look so delicious. They’re probably great in the morning, especially when served with a nice, hot cup of coffee. gosh, you’ve just made me missed my home for christmas even more Ray…..
Hi! I would like to know how many cheesecakes does the recipe can produce? Thanks! I just finished baking this and i already had 3pcs in 1 sitting…it’s addictive. Thanks for the recipe. Will be trying this soon…like later. Lol. Looks delish! Would cutting down the 1/2 c sugar (since condensed milk is already sweet) affect the muffin consistency? Also, Nora Daza of long time ago has a recipe for cheese chiffon cake and it’s Very Good. Have you heard of this? Thanks, Ray! Hi I think it will but I havent tried. I had a similar recipe before that I tried to cut down the sugar and it did affected the end product but not that much. Will have to experiment on that cheese chiffon, sounds fantastic.